In our science class today we had a Skype conversation with a girl names Tanya Harrison, who is a scientist and geologist who works with outer space, mainly The planet Mars. 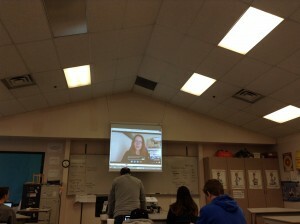 Our class was able to ask her some questions throughout the call. -Mars is the only planet that is possible to find life, due to the finding of water. -Rovers can cost 7 thousand to 1.2 billion dollars. -It is difficult to bring a rover back from Mars because, how heavy it would be. i found it very helpful and interesting, speaking and asking her question about space because, this is a topic she learns about everyday and does for a living.